Many people know a lot about the world we live in, but almost nothing about our neighbourhood in space. Sun.org believes it`s important (and interesting!) 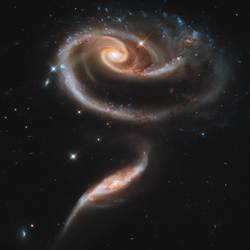 to understand what the universe looks like and which are its main processes. For thousands of years, some of the most fundamental questions were: what is the world made of, where do we come from and what`s the meaning behind the strange movements of these little dots of light in the night sky? Today we are able to answer these questions; we are able to trace down the origin of the atoms in our own body to nuclear fusion in the stars and their distribution in space through supernova and planetary nebulae. We are able to understand how the basis of our existence, the Sun, the Earth and all the other planets originated; we can even observe the same processes today with our own eyes as many other stars are currently being born in the same way that our Sun and Earth were born 4.6 billion years ago. Any great Greek thinker would have given everything to obtain this knowledge... and today that we are able to answer all these questions in detail, it seems that many people are not asking these fundamental questions any more. It is our aim to increase interest in this subject, with the help of the many beautiful images we have today of the cosmos. We are a small team of people that share a passion for exploring the universe, for the pure fascination or for a better understanding of our part within the universe.